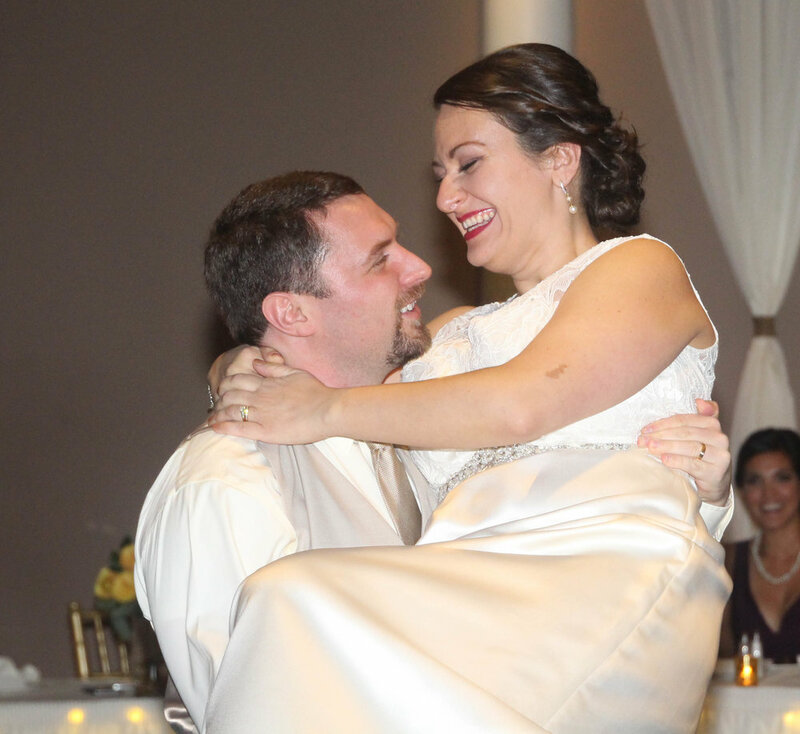 Jen and Anthony planned their wedding in just about 8 weeks! It was SO MUCH FUN! We had a meeting and a tasting right away to get those details into place and order wedding invitations. Then it was a matter of the bride choosing a dress and getting vendors hired. They used our favorite vendor list and hired people in no time! 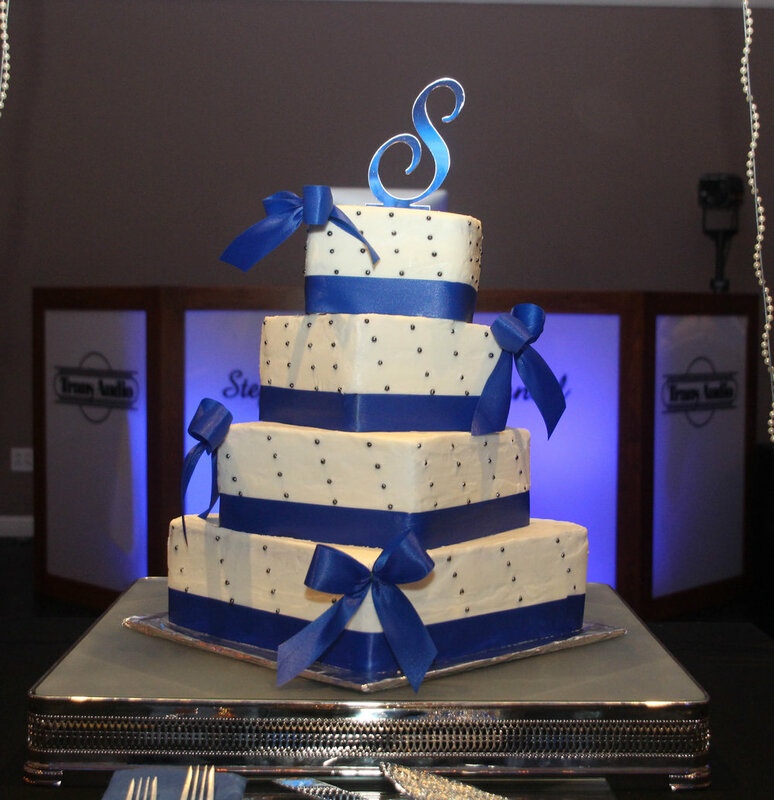 Isn't this cake from Designer Desserts beautiful? It went perfectly on our rhinestone cake stand. They had a smaller wedding and split the room into two- a cocktail room and a dinner area. 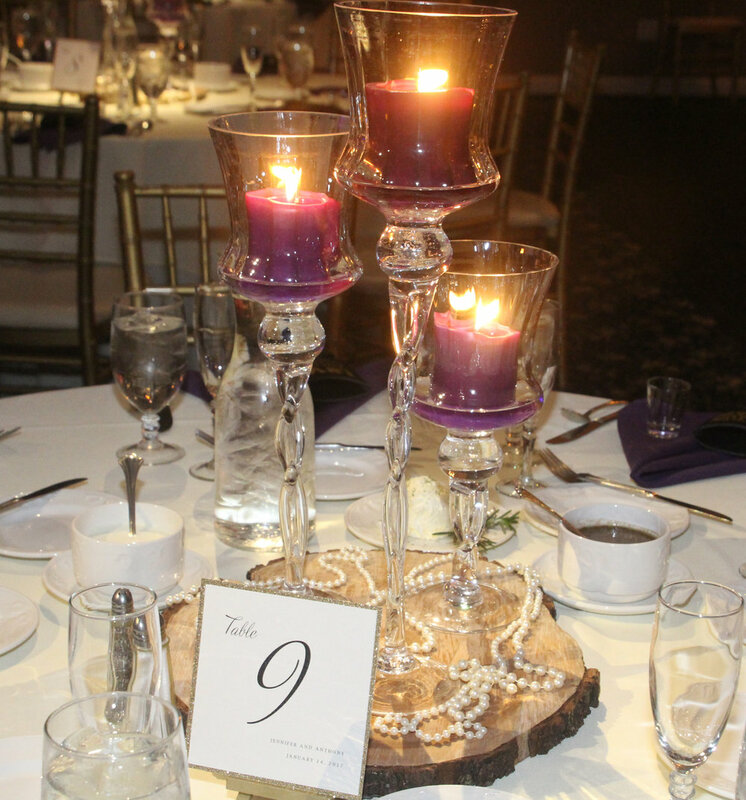 They went with table numbers that perfectly matched their wedding invitations which were purple with gold glitter. Congratulations to the newlyweds! I had so much fun working with the two of you and planning your wedding! It was a great party! Alyssa and Gabriel had a beautiful wedding! Their colors were navy and coral. The groom dressed in a navy tux and the rest of the guys were in gray. It looked great! 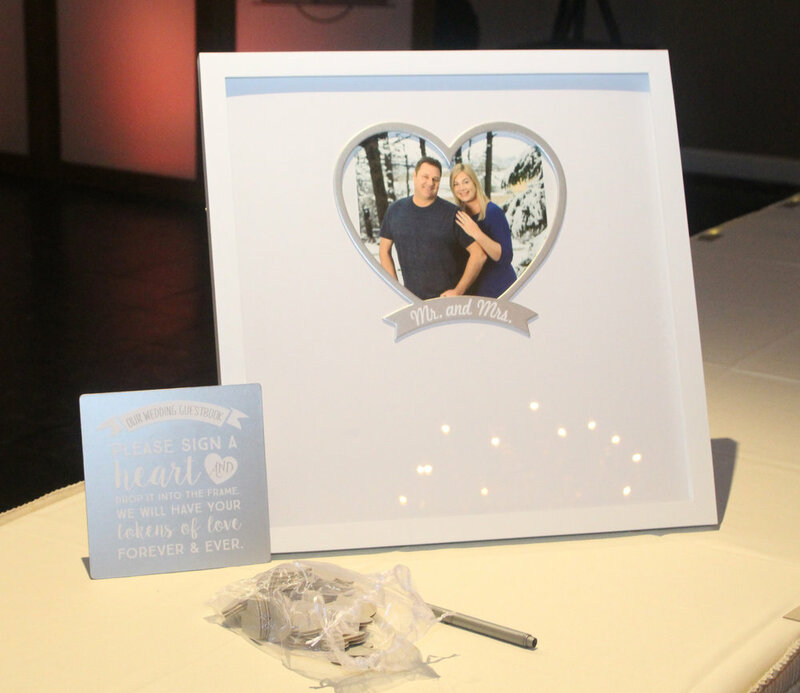 The ballroom was decked out in navy table cloths, coral napkins and pretty sparkling centerpieces. The bride was stunning in a flowy white dress. She happens to be a sister to one of our 2011 brides! We love when families/siblings/etc. have their wedding with us. It's always so beautiful and different. Take a look at this gorgeous rustic wedding. I love the combination of wood and lace with touches of dark red and grey. I just LOVE the lace curtains behind the head table! They were such a great group of girls! Cheers to the new Mr. & Mrs!!! Introducing Mr. & Mrs. Langford! Kari and Graeme kicked off 2017 with a gorgeous Monday evening wedding! Kari's mom acted as the officiant. Ceremony's like this are my personal favorite! Kari's beautiful girls were her bridesmaids and her oldest escorted her down the aisle. Ahh, fall... The crisp air, the beautiful array of colors, leaves all around. Congratulations Mr. and Mrs. Morris! I have had the pleasure of taking part in many weddings in my 3 years at Aberdeen Manor, but Brittany and Brent are the first couple that I have known personally. It has been such an honor to be a part of their special day. Brittany was escorted down the aisle by both her father and grandfather. I thought that was SO sweet! Congratulations Mr. & Mrs. Crider!!! The ballroom was stunning tonight. Our bride, Shauna was all about the details and it showed! The table settings were so pretty. Gold charger plates, black napkins, menu cards, Godiva chocolates in pretty gold boxes. I love this ceiling decor! Black and gold Chinese lanterns, gold ornaments, and black and gold swagged fabric. It went perfectly with the theme. Congratulations Mr. and Mrs. Patton! It has been a pleasure! 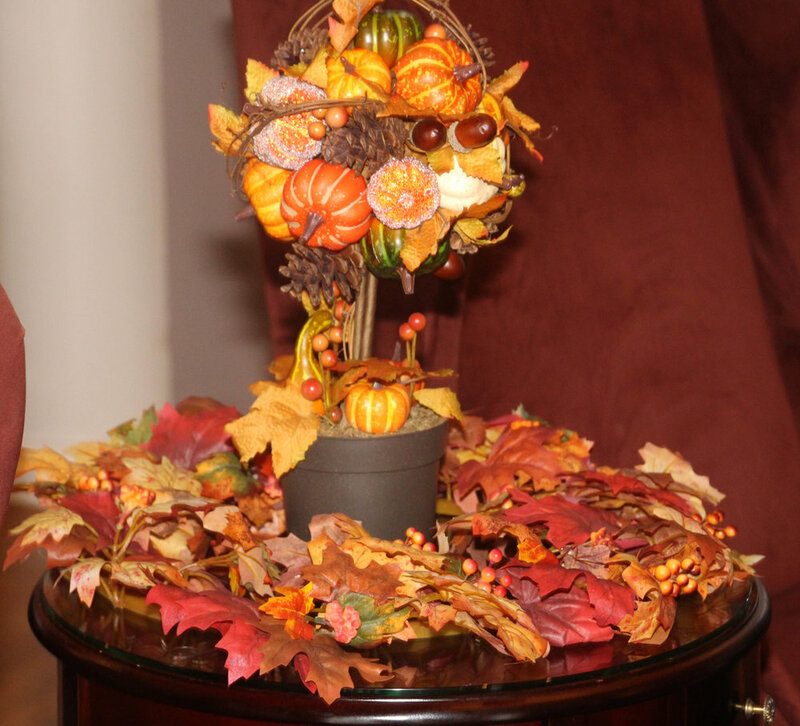 On this icy, cold December day, let's take a look back at an early October wedding! Courtney and Nick celebrated their wedding on a gorgeous October Sunday. The mix of teal and purple was so pretty together! 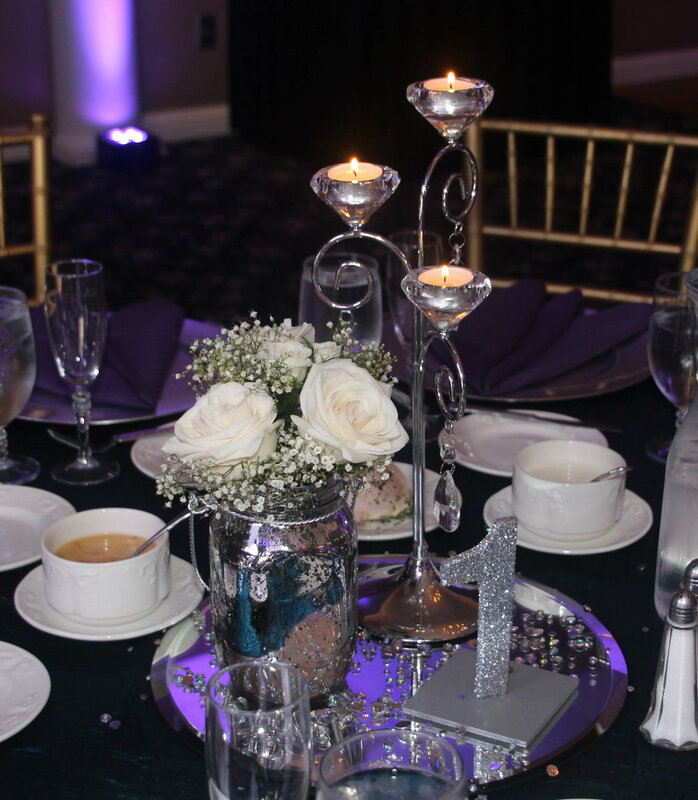 Lots of sparkle and bling added to the centerpieces and decor. 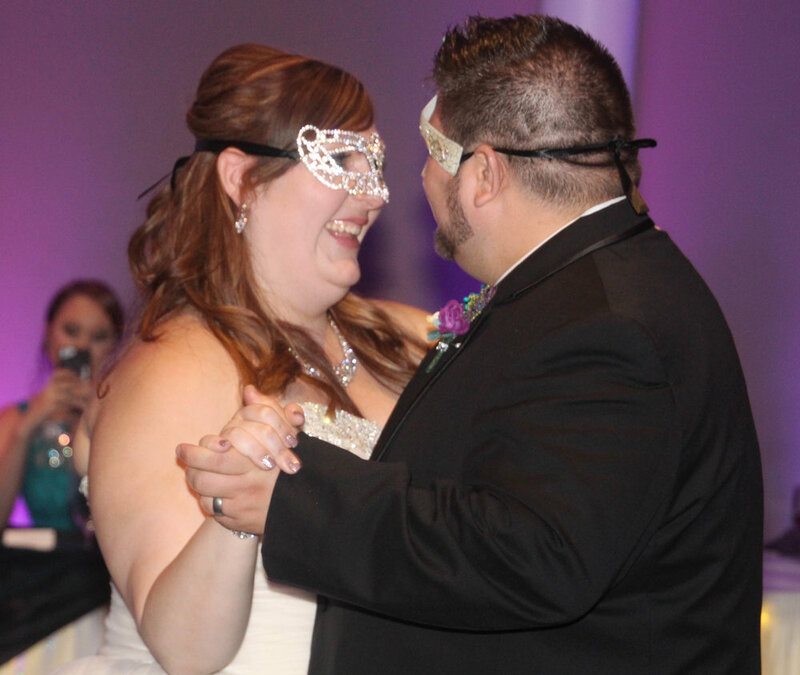 The bride's mom surprised her by playing her favorite song "All I Ask of You" from Phantom of the Opera while the bride and groom has their first dance complete with masks! It turns out that Courtney had always planned on that being her first dance song with her husband. Ironically, that day on TimeHop it came up that five years ago, Courtney had put on Facebook- "Future Husband, we are dancing to All I Ask of You at our wedding." Isn't that awesome?!! November was once again a busy month around here...and things didn't slow down in December either! Here are some pictures of the weddings that I had the pleasure of coordinating in November and December. I hope you enjoy! Congratulations Mr. & Mrs. Bobier! Congratulations Mr. & Mrs. Sammartano! Congratulations Lauren & CJ Turner! Thank you for letting Aberdeen Manor be a part of your big day! It was such a pleasure getting to know you both! Here's to a lifetime of love, happiness and laughter! Married in a winter wonderland! Congratulations Mr. & Mrs. Rockafellow! What a gorgeous wedding we had tonight. 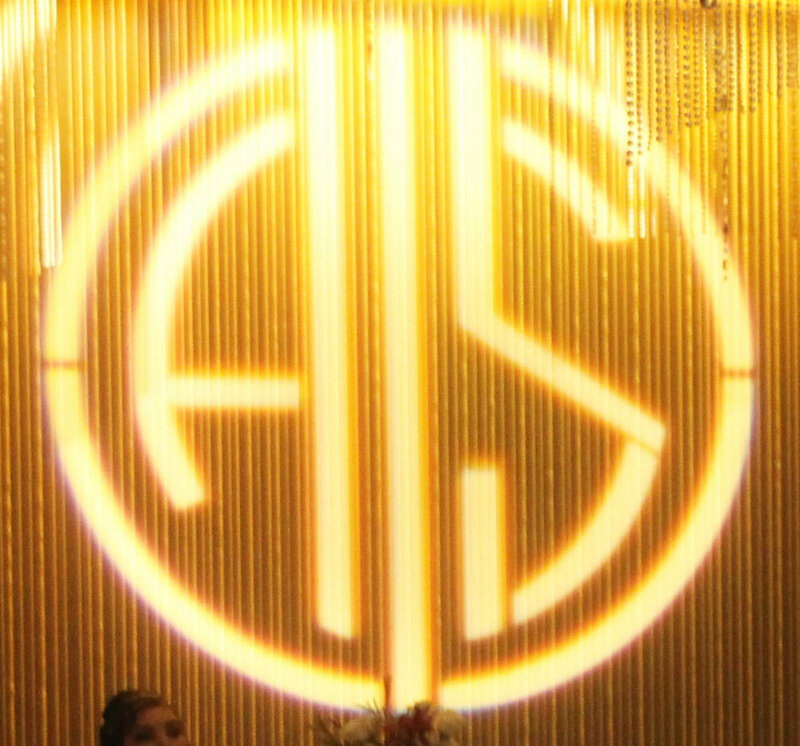 The bride came in with a 20's Great Gatsby theme in mind and it played out perfectly. Many guests even got into the mood and wore flapper dresses, headbands and feathers. The place cards were attached to Freixenet champagne bottles which went perfectly with the theme. 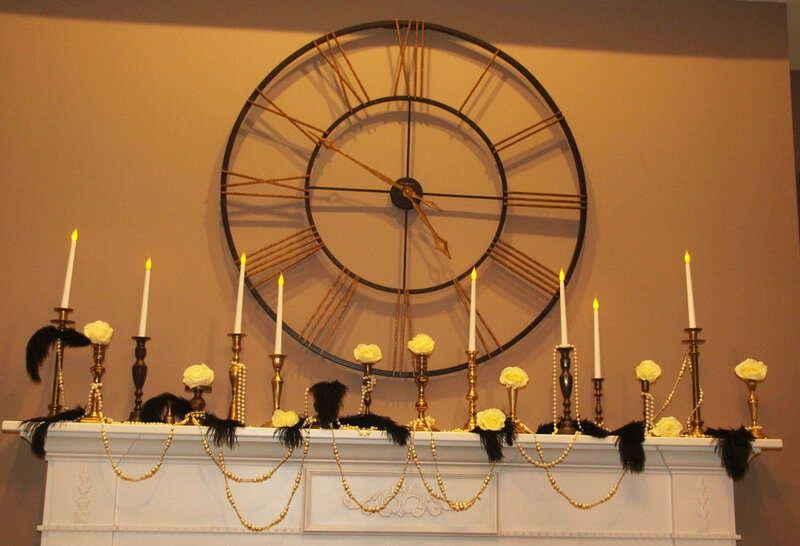 The bride collected brass candlesticks from antique shops and used them in the centerpieces and the mantel. We added some pearl draping, candles and uplighting to the chapel to add to the effect. I enjoy weddings. 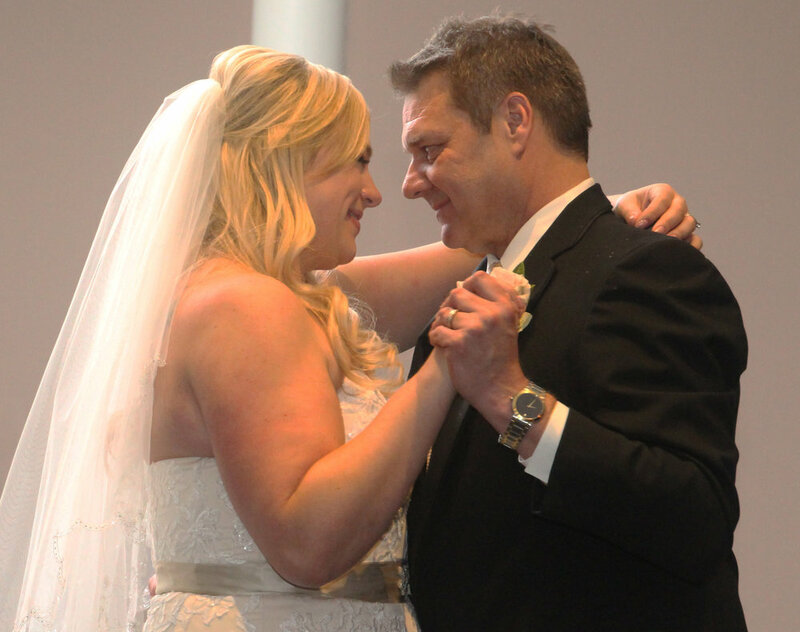 I really enjoy weddings that the emotions are flowing, whether they're shown in smiles and hugs or big tears of joy, and that's exactly what I got to witness with Mark & Christie. From our first planning meeting to our last, BOTH Mark & Christie were always smiling and enjoying the process of planning their wedding day. And although it was a chilly, fall garden wedding, it was enjoyed by the many that attended. September and October have been a whirlwind around here! Weddings, weddings, and more weddings! Here are some beautiful photos of the weddings that I have had the pleasure being a part of at the end of August and September. Come rain or shine... a wedding! Although the couple had planned to have their wedding ceremony in the garden, the weather forcast seemed a little unpredicable so rather than chancing it, they "tied the knot" in the chapel. 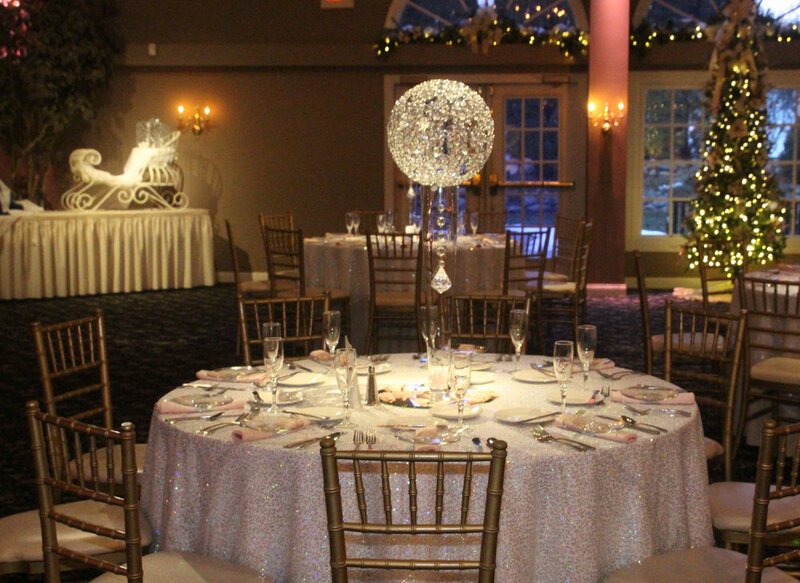 (One of the best reasons to choose Aberdeen Manor is we can provide you a beautiful indoor setting in the event of rain...or heat...or humidity...or just because you decide to change your mind the day of!) Just before guests started to arrive a rainbow appeared across the top of the chapel. It was a gorgeous site!--just like the bride. 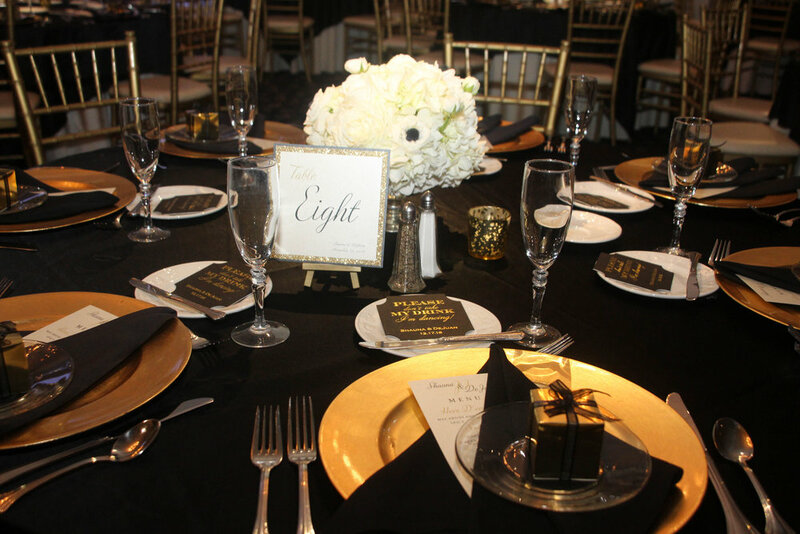 Anna & Joe knew at our first planning meeting what they wanted the ballroom to look like-- classic black and white with silver sparkle, and I'd say they got want they dreamt. 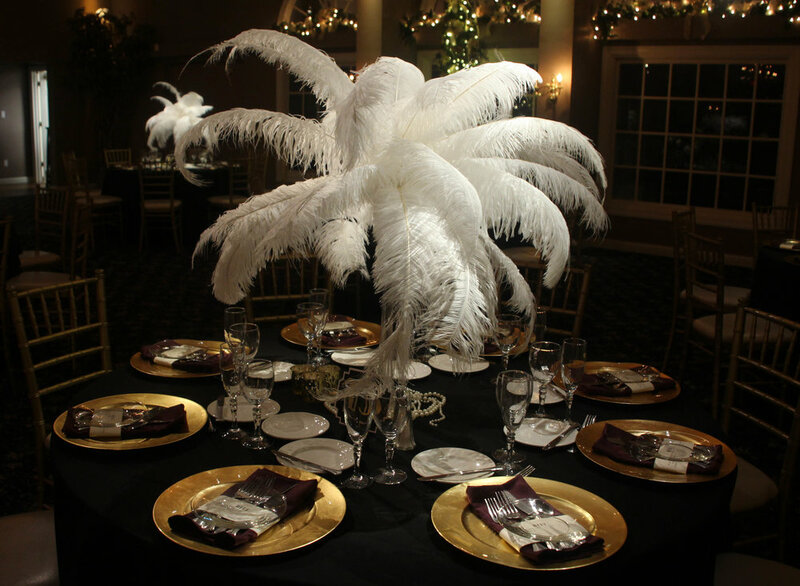 The guest tables had silver embroidered runners down the center, black napkins and beautiful crystal vase sets or crystal globes atop a pilsner vase on round mirrors to reflect the soft candlelight from the votive cups. There were touches of pink in the bouquets, the pink votive cups used in the centerpieces and lighting behind the head table. Their back drop consisted of black curtains gathered with rhinestone bracelets and crystals hung behind from ceiling to floor. Anna wore a white gown with a belt and neckline embellished in rhinestones while Joe wore all black--both looked perfect for the part. It sure felt like fall today with the cooler weather and even a little rain. Michele and Brad made a good choice on having their ceremony in the chapel because it started to rain right around 5pm. Brad and Michele wrote their own vows and they were some of the sweetest words that I have heard in a wedding ceremony, very deep and truly heartfelt. These two planned their wedding while living in California. The first time we spoke, I had them get on the webcams and see the ballroom set up for that evening's wedding. We have had many, many phone conferences, emails and meetings. I love their mix of fall colors and decor. It was such a pleasure planning this day with you! I have enjoyed all of our talks and hope that they helped make your planning easier. I wish you both a lifetime of happiness!